Sebastian Vettel's somewhat spontaneous celebration at the Indian Grand Prix might have been a crowd pleaser, but the matter didn't sit too well with the FIA. 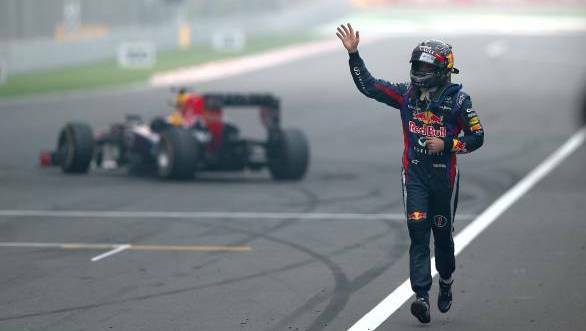 After winning his fourth consecutive world championship title at the Buddh International Circuit, Vettel drove onto the start-finish straight and pulled a few donuts. To be fair to him, the donuts were terribly well executed, and the crowd went completely mad with Vettel's post-race shenanigans. The Red Bull Racing driver then proceeded to climb out of his car and bow down in front of it at the BIC, once again thrilling the crowd in the main grandstands immeasurably. The ecstatic German then ran to the grandstands and threw his gloves to the cheering fans, before leaping over the pitwall to continue celebrating with his team. As it so very often happens with the FIA, there were to be consequences to his actions. What happened then? Well, the men in the stewards room tut-tutted disapprovingly at Vettel's behaviour. They decided to reprimand him for his actions, which is exactly what happened. Three reprimands in one season, can lead to a 10-place grid penalty at the next race. Vettel, fortunately for him, has only incurred one reprimand thus far in 2013, which means, so long as he behaves himself over the next couple of races, he'll be just fine. Adding to the reprimand that was dished out to the newly crowned quadruple world champion, the Red Bull Racing team was handed a fine of 25,000 Euro. All this for a spontaneous bit of celebration, you may ask. Well, that is just the way the FIA rolls, isn't it? placed under the exclusive control of the marshals who will take the car to the parc fermé." Vettel, as was obvious from his revelry, didn't conform to the rules of Article 43.3 and there was no escaping either the reprimand or the fine. 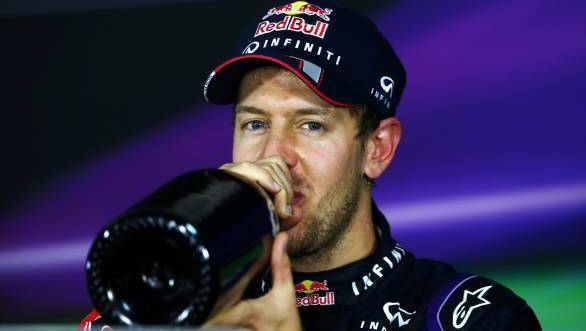 Vettel, however, showed no remorse for his actions at all, stating in the post race press conference that while his race engineer, Rocky, had called for usual post-race procedure, he'd decided against it, owing to the fact that he'd just won his fourth championship title. For a driver who is very often accused of being robotic, despite all the fist-pumping and finger waving, Vettel's show of emotion at the Indian GP was very real. For the FIA to curb that, however, is a measure seen as terribly restrictive. But Formula 1, over the years, has become exactly that - restrictive. The FIA's explanation, however, is that Vettel's move was dangerous, given that there were cars still on track. Well, the FIA dished out a reprimand to Mark Webber at the Singapore GP earlier this year, when the Australian hitched a ride on the sidepod of Fernando Alonso's Ferrari. In that case though, there was good reason, given that the following car of Lewis Hamilton very narrowly missed the pair of them. So, is the FIA's reaction something to be surprised about? Well, no, not really. After all, when was the last time anything spontaneous and unfettered happened in the world of F1 where everything usually happens according to the book? The drivers get told off for swearing on live television last year, didn't they. But it isn't like that has bothered the Red Bull team all that much. How did they celebrate their fourth world championship title? 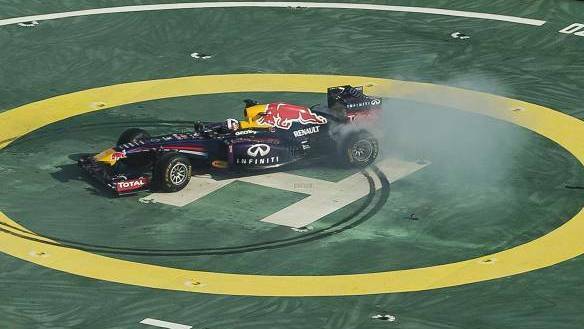 Well, they took their RB7 to a helipad at the Burj Al Arab and had good old David Coulthard pull a set of donuts up there as well. Take that FIA!